We were led into the final dark room, and we felt the ghost of her before our eyes found her. The air in her glass chamber was chilled to -20C in order to preserve the bundle that crouched before us. Juanita, the young Incan girl who was sacrificed to appease the Gods, sat in a foetal position with her face gaping towards us. Arequipa is shaken by 8-10 tremors a day, and the gaping crack in the bell tower of the white-stoned Catholic cathedral stands testament to this fact. The city is surrounded by volcanoes, including the active El Misti. In late 1995, Johan Reinhard and his Peruvian climbing assistant Miguel Zarate made a discovery that made its own reverberations around the world, revealing new light on the former Inca empire that had lived there half a millennia before. Juanita, otherwise known as ‘La Niña de los Hielo’ (‘The Girl of Ice’) was found on Mount Ampato. 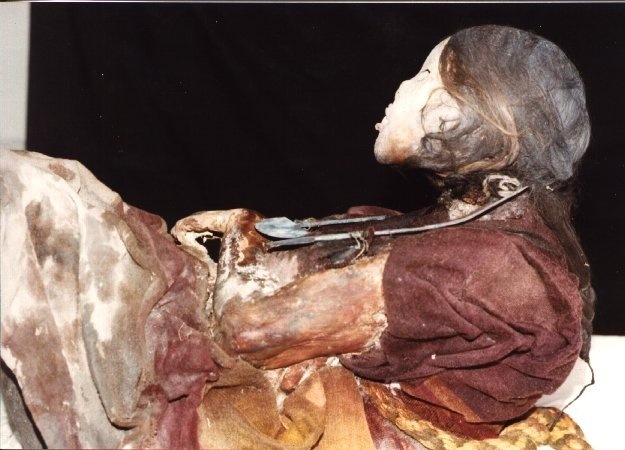 Her mummified body was extremely well-preserved due to the fact she had completely frozen – her skin, hair, nails and organs were all intact. Only her face showed signs of deterioration, due to temporary sun exposure when volcanic ash from nearby Sabancaya melted the ice she was encased in, and caused her body to slide down the mountain into a gulley. The discovery was so significant because it allowed us a rare glimpse into one of the great lost empires – the Incas. She is one of perhaps hundreds of children sacrificed high up in the Andean peaks, with 115 sites sacred sites excavated so far. Each site contains rich textiles, ornate wooden utensils and small statues of silver and gold. The purpose for these sacrifices, or ‘capacocha’ was to appease the gods and mountain deities, and to ensure rain and abundant crops. Some scholars also cite that the rituals were in order to protect the Incas, or provide escorts for the emperor in the afterlife. Others who are more cynical believe children were offered so that their parents could increase their links with the emperor and become more influential in society. Most sacrifices were children between the ages of 6 and 15 years old, as children were seen as ‘pure’; Juanita is estimated to have been around 14 at the time of her death. It was considered a great privilege to be selected for sacrifice, and even Incan priests would offer their own children to the emperor. The chosen children were lavishly treated in the months leading up to their pilgrimage into the mountains, and were fed on high protein diets consisting of maize. Beforehand, a feast was thrown in Cuzco by the emperor, where the children and their families would be honoured. Their hair was braided and they wore the finest clothes, made from rich vicuña wool (the fibre of the Gods), and jewellery made from precious metals, beads and feathers. The journey to the icy summits was lead by priests, and it was arduous with a great risk of dying from exposure given low temperatures and high altitudes of over 20,000ft. If they reached the top, which was considered to be closest to the Gods, the children were given an intoxicating drink containing coca, and then killed with either a blunt blow to the head or strangulation. They were then buried with statues of llamas and other precious items. Priests would revisit the sacred site, or ‘huaca,’ with coca leaves and food. Approaching her clear coffin, you could feel the coldness of death pressing against the glass. Staring into her face, a wash of unease settled in the crooks of my elbows and knees – it was uncomfortable studying her as it felt like she belonged to the mountain, and another time. Nevertheless, I kept my eyes fixed on her, expecting she would move and resettle her shawl, or uncross her stiff arms that had cradled her for over 500 years. I tried to imagine how it must have felt to be chosen and revered by the emperor, enjoying celebrations in your honour, but still knowing that you would have to die once the pilgrimage was over. The Incas were believed to exhibit more ‘humane’ sacrifices than the Aztecs and other pre-Colombian cultures, but I could only hope that Juanita and the other children felt nothing at the end.